To create a new custom field within your web form go to Design tab, click the Add New Field button at the top left of the editing screen. Add a name in the Label field, choose a field type and enter a default value (if needed). You can also set the field as required. 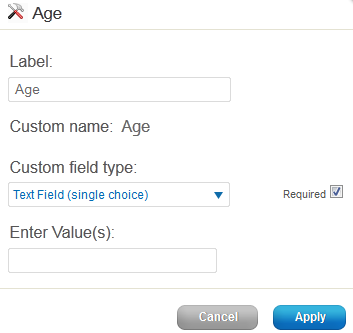 Click Apply to place the new field on the form then click and drag the field where you want it. The field collects information from subscribers as they opt-in to your mailing list. Any time you wish, you can change the label of the custom field. All the custom field data collected through web form subscriptions can be used in your messages as personalization fields. The instructions on how to use them can be found here.